Alkalmas 2,5mm vastagságig kazánfelújításhoz használt huzal vágására. The Demon Killer Pliers is a Multi-Function Cutting Pliers designed for E-cig DIY which can be used with coil building, diamonds selecting, circuit checking, eyelash cleaning and so on. 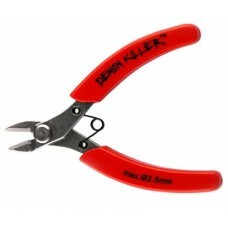 Made of 3Cr13 steel material, the Demon Killer Multi-Function Cutting Pliers is durable and attractive. Just get it as a spare part to make your coil-building easier.